In the heart of Florida, Heritage Key will set a new standard for destination tennis resorts. Surrounding the planned state-of-the-art Racquet Club & Spa-with its 20 hard and clay courts-Heritage Key's Tennis Villas offer first-class accommodations in a world-class tennis setting, within one of America's most inviting areas. Power Tennis experience will provide an unmatched blend of competitive and recreational play with a unique array of peak performance, health and fitness resources. 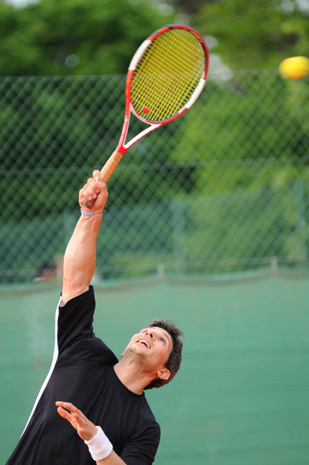 Whether your goals include the pro tour or simply to reduce aches and pains or increase energy levels, our programs may significantly help you improve your quality of life as well as your tennis game. Professional and amateur tournaments will be the backbone of on-court activity throughout the year, giving resort guests the opportunity to compete as well as watch and mix with up- and-coming professionals in a very personal setting. When you're not taking part in our many tennis and spa activities, you will enjoy all that the spectacular Central Florida location has to offer. Heritage Key is conveniently located just minutes from Orlando International Airport, Disney World and the Florida Turnpike, placing the state's most popular attractions right at your doorstep.